The purpose of this non-confirmatory study is to determine if SOM230 has adequate efficacy and safety to warrant further clinical development in cluster headache (CH). This study will have two parts. Part A will be a parallel design SOM230 vs. Placebo, and following an observed signal in Part A at an interim analysis, Part B of the study will be a comparison of SOM230 to sumatriptan. High-flow oxygen was proven to relieve cluster headache attacks within 15 minutes for nearly 80% of attacks with no serious side effects in a controlled clinical study (see the JAMA High-flow Oxygen Study). In fact, oxygen is considered to be the safest method of treating acute cluster headache attacks. The approach is to use 100% pure oxygen at a flow rate of 12-15 lpm, sometimes higher, through a non-rebreather mask for approximately 15 minutes or until the attack is stopped. Although that sounds pretty straightforward, learning how to use high-flow oxygen for quick relief takes some know how and practice. On this page, we describe how to get it, how to use it, and how to be safe with oxygen in the home. Welcome to our New Patient Guide, where you will learn what cluster headache is, how it is diagnosed & treated, and what you can do to manage this painful condition. 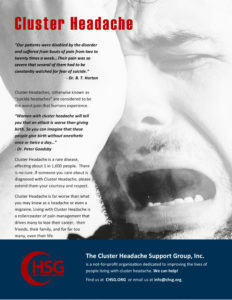 You’ll quickly discover there is no “silver bullet” to stop the pain of cluster headaches. In fact, in many cases it takes so long to come to a diagnosis that you may have already been through several drug trials with your physician or neurologist in order to rule out other maladies. This is not at all surprising because cluster headaches are a primary headache type. In order to diagnose a primary headache type, your doctor must first rule out secondary headache types, including headaches caused by trauma, lesion, or tumor. This is for your safety, but it can certainly be frustrating going through the various diagnostics with no real pain relief. Calcitonin gene-related peptide (CGRP) is a validated target for the treatment of episodic migraine. Here we assess the safety, tolerability, and efficacy of TEV-48125, a monoclonal anti-CGRP antibody, in the preventive treatment of high-frequency episodic migraine.